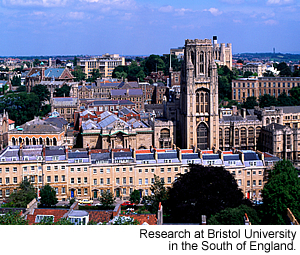 Click for more News from or about Bristol. See also Books about Bristol, England. According to recent research from Bristol University (England, UK), depression in pregnant women may increase the risk that their children have depression at age 18-years. This association is considered important because depression in late adolescence is a worldwide health issue and identifying early-life risk factors could help to inform prevention and intervention. Together with colleagues, Dr Rebecca Pearson from Bristol University's School of Social and Community Medicine examined possible associations between prenatal and postnatal depression in women and later depression in their children at age 18. The researchers analysed a UK community-based study population with data from more than 4,500 parents and their adolescent children. The results of the study suggest that children were more likely to have depression at age 18 if their mothers were depressed during the pregnancy. For the purposes of this study and report, 'depression' was defined as increases in prenatal (also known as antenatal) maternal depression scores measured on self-reported depression questionnaires. Postnatal depression was also a risk factor among mothers with low education because their children were also more likely to have depression based on increases in depression scores, according to the study. "The findings have important implications for the nature and timing of interventions aimed at preventing depression in the offspring of depressed mothers. In particular, the findings suggest that treating depression in pregnancy, irrespective of background, may be most effective," concluded the study. Although the research paper describing this study is available online it was not available for free (i.e. without login via a subscription service) access when we tried to find out more. Details of the paper follow below. 'Maternal Depression During Pregnancy and the Postnatal Period: Risks and Possible Mechanisms for Offspring Depression at Age 18 Years', by Rebecca M. Pearson, Jonathan Evans, Daphne Kounali, Glyn Lewis, Jon Heron, Paul G. Ramchandani, Tom G. O'Connor and Alan Stein is published in JAMA Psychiatry, 9 October 2013. Health News is included on the IvyRose website to inform visitors about current health issues and research, but not to endorse any particular view or activity. Any views expressed in the article above are not necessarily those of IvyRose Ltd.. Material in this news item was released by the source indicated below on 10 October 2013 and may have been edited (e.g. in style, length, and/or for ease of understanding by our international readers) for inclusion here. For further information, please visit their website.